With Denim Première Vision debuting the first of its roving show concept in London Dec. 5-6, all eyes are on the birthplace of the mods, punk and high street fashion. And few cities represent denim culture’s contradictory obsessions with the old and new quite like London. The event is also shining a spotlight on one of the more eclectic and free-spirited fashion capitols at a time when its art scene is thriving, sustainability is spurring new commercial spaces and the British Pound slides closer to the euro and U.S. dollar. From eco-conscious stores that tout having “the cleanest air in London” and to tailoring shops that set the standard for quality and taste, here’s your guide to London’s must-see retail concepts, experiential restaurants and other curios of curiosity that can’t be missed. A picture of perfect environmental health, the new Stella McCartney boutique is the first commercial space in London with clean air. Equipped with Airlabs, the low energy filtering process removes 95 percent of air pollutants and harmful gases through a hidden ventilation system. The boutique, which opened in June, also features biodegradable mannequins made from a sugarcane-based bioplastic material, foam furniture made of recycled materials and an indoor installation made with rocks from the McCartney farm. “We could have done anything up there, but for me to be able to have a garden inside a building in Bond Street, just feels so luxurious,” designer Stella McCartney said in a statement. The Swedish denim brand’s retail store in Shoreditch, is a denim head’s one-stop shop for vegan denim. The brand recently announced that it’s ditching leather trims in favor for more eco- and animal-friendly Jacron labels. Shoppers can also stop by for on-the-spot repairs. As the city’s highest public garden, Sky Garden offers sweeping views of London in a green and leafy environment. The park, designed by award-winning landscape architects, Gillespies, boasts planted terraces, each with a different theme. A prehistoric forest is created with tree ferns and fig trees; Mediterranean and South African flowers evoke the feeling of a mountain ravine. If the urban horticulture wets your whistle, enjoy a drink or bite to eat at one of the bars and restaurants located at Sky Garden. Sketch London’s plush millennial pink velvet banquets are known around the world, thanks to being one of London’s most-Instagrammed hot-spots. The Mayfair restaurant has earned two Michelin stars, but you’ll be too busy documenting its fantastical interior design, dreamy use of color and texture and futuristic space pods that double as loos, to properly savor its modern European cuisine. Get your fill of avant-garde design and boundary-pushing streetwear at Dover Street Market. The retail institution turns shopping into a museum-quality, curated experience with special installations and shop-in-shops. This original emporium of cool is stocked this fall with pieces from Raf Simons, Sacai, Loewe, Vetements, and more. The store is also home to a sneaker space with the latest styles and collaborations from Converse, Vans, Adidas and Hi-Tec. And if you’re feeling peckish, grab a bite to eat on the third floor at Rose Bakery. Discover Instagram-worthy spots with Alternative London. The tour company offers a series of walking and bike tours including a Shoreditch food tour, which takes guests to food destinations in Shoreditch, Brick Lane and Spitalfields. 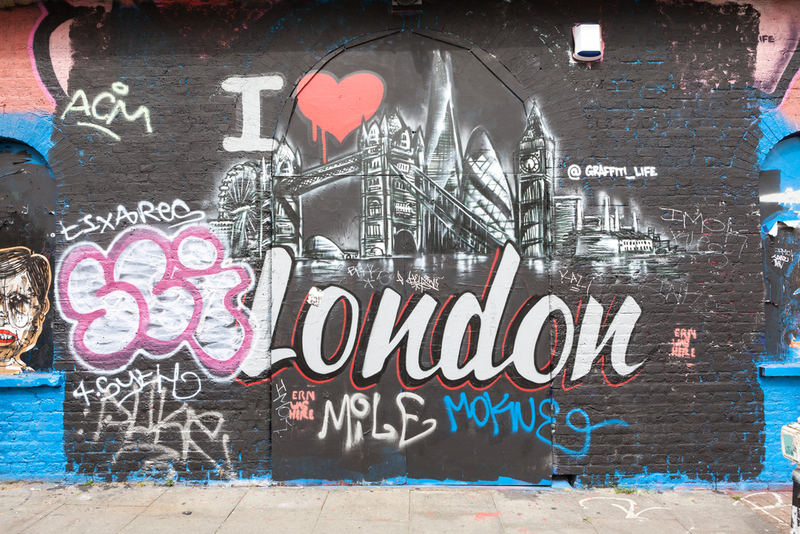 Or, take in the un-commissioned work by local and international street artists during a walking tour of trendy East London. The company also offers street art workshops where you can create your own spray paint masterpiece. Denim purists will relish time well spent at Blackhorse Lane. Considered to be “London’s first denim haberdashery,” the Shoreditch shop offers denim heads everything they need to make or repair a pair of jeans. The store also offers Blackhorse Lane’s complete ready-to-wear collection denim and jackets for men and women, as well as services like on-site hemming and repairs. Stay in the neighborhood and visit other authentic denim hotspots like Edwin, Belstaff and Son of a Stag. Seven Dials, 14 Earlham St.
One of Rivet’s 50 Influential, this vintage emporium, owned by Douglas Gunn and Roy Luckett, offers a shoppable history lesson in denim and men’s wear. Discover everything from 1950s British railway worker jackets and Royal Navy coveralls, to the showroom’s latest publication, Worn, made in collaboration with Kingpins. What’s more classic Britain than a traditional Sunday roast with friends? Try The Albion in Islington, a Georgian pub that ranks high on several publications’ list of the best roasts in London. CN Traveler recommends the slow-roasted pork belly with all the trimmings, like Yorkshire pudding, while The Times suggests the “knockout wild duck.” Both say diners should come with an appetite and settle in near one of the pub’s log fires.